Lancia doesn’t make the news much anymore, but once upon a time they made headlines in motorsport. The bold Italian car maker created racing machines that were beautiful, fast and sometimes unconventional. The Lancia 037 was all three and has the distinction of being the last rear wheel drive car to win the WRC. This 1/18 diecast of the Lancia 037 Martini was made by Kyosho. The core of it is well constructed with small, potentially fragile details littered throughout. I was a bit nervous taking it outside but rally cars belong in the elements. The Martini livery is incredibly vivid, especially in the sunlight. Sponsors cover the body as well as the sidewalls of the tires. And the rims that the Pirellis wrap around are pretty convincing. The paint scheme is not perfect though. Note the orientation of the Lancia logo on the rear spoiler and the Pininfarina logo in front of the rear wheel. Now look at the orientation of those same logos on the other side. Yes, I am being picky but these Kyoshos are not cheap. Still, so much is incredibly right about the model that I feel bad for complaining. The Martini livery as a whole is so beautiful, it will distract you from whatever small flaws you may find. It will also make you compulsively take more pictures. At the back are a set of mudflaps and a very convincing exhaust pipe. Those mudflaps are not hard plastic, they are some sort of rubber and they are flexible. Another minor flaw you can see in this picture is the right tail light is a little crooked. I’m tempted to take a pair of pliers to it but it does not move easily and I’m afraid I would do more harm than good. So I’ll just pretend its trying to replicate damage from a 30 foot long jump in a particularly harsh rally stage. The car does in fact open up and inside is that wonderful supercharged four cylinder that powered the car to many rally victories. The front opens too but not very far. There are lots of cool details within but good luck seeing them. The interior is wonderfully detailed but it was difficult for me to get a picture of it. So at the very least you can use this picture to pretend that you are about to ride shotgun. 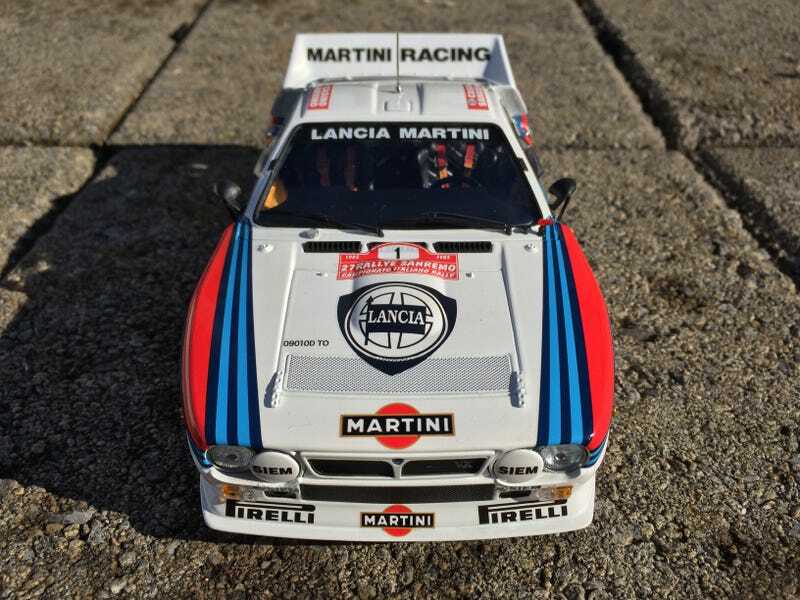 So that is my review of the 1/18 Lancia 037 Martini by Kyosho. Now, I am not the first person to do a Kyosho 037 on LaLD, that honor goes to Sn210. If you want to know what the finer details of this diecast are like, check out Sn210's post on their wonderful all white presentation 037. And if you would like to see a totally rad video of the Lancia Martini team in action in its heyday, check out this video I posted of the Martini 037 and LC2. Remember, you can never have enough Lancia Martini in your life.